HCG Pregnyl information and description. HCG is not a steroid but it is widely used in athletics today. HCG Prengyl is a natural protein hormone secreted by the human placenta and purified form the urine of pregnant women. 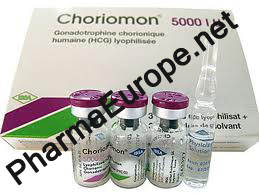 This hormone is not a natural male hormone but mimics the natural hormone LH (Luetinising Hormone) almost identically. This LH stimulates the production of testosterone by the testis in males. Thus HCG sends the same message and results in increased testosterone production by the testis due to its effect on the leydig cells of the testis.